With Apple lovers willing to pay as much as Rs 1 lakh to get hold of the 16GB variant of the iPhone 5S before it comes to India officially, traders at Mumbai's Heera Panna and New Delhi's Gaffar Market are preparing to bring the devices in as soon as they hit markets abroad. While Apple fans in India might frown at this country not being included in the first wave of countries to get the new iPhones, there are some very happy faces in the gray markets here. With impatient Apple lovers willing to pay as much as Rs 1 lakh to get hold of the 16GB variant of the iPhone 5S before it comes to India officially, traders at Mumbai's Heera Panna and New Delhi's Gaffar Market are preparing to bring the devices in as soon as they hit markets abroad. A dealer in Gaffar Market even quoted an atrocious Rs 1,30,000 for the 64GB variant for the iPhone 5S. That is almost three times the US price of the phone. Even if you are willing to pay, however, there is no guarantee you can get your hands on the all-new gold variant. The shopkeepers were not willing to take an advance for the phones and asked us to check again on September 21, the day the phone will become available in the US and other countries included in the initial launch. Some are taking contacts of prospective customers, promising to call as soon as they nail the first consignments. This first set of phones will mostly be shipped in clandestinely from Hong Kong and Singapore. This means that despite the premium paid you will not get any sort of warranty. Meanwhile, it seems the iPhone 5C isn't really generating much buzz. This version is expected to retail around Rs 10,000 less than the iPhone 5S. Interestingly enough, the traders at Gaffar Marker size up customers before quoting a price. So while one of them quoted Rs 120,000 for an iPhone 5S 16GB to someone holding an iPhone 5 and BlackBerry Q5, he offered us the same phone at Rs 95,000. The traders know they can make a killing. But then there are also buyers like Anshul Gupta, a Delhi resident who is extreme by even early adopter standards. He says he will go to any length to own the iPhone 5S the day it is launched, but at the same time does not want to submit to their blackmail. 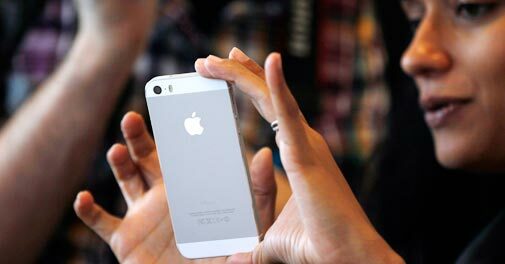 "Dealers in Gaffar are asking for almost double what the iPhone 5S will cost when it is launched in India. Instead of giving them so much money, I have asked my travel agent to book tickets to Singapore. By paying a little extra I can buy the phone myself and also enjoy a holiday," Gupta told Business Today. Despite all its numbers around the world, Samsung has never been able to generate this kind of enthusiasm for its phones, ever. Did Apple launch new phones in 5S and 5C? iPhone 5C: Is Apple's new phone really cheap?